Every time I see that building, I cringe at those panels of Pepto-Bismol-colored crap on it. I feel even worse about it now. 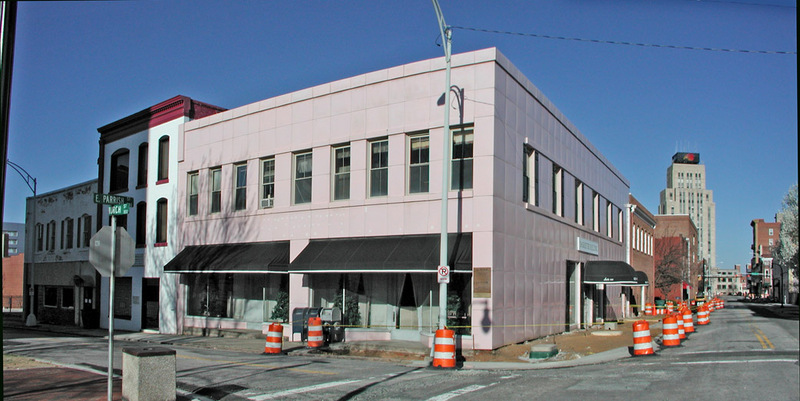 Those "panels of Pepto-Bismol-colored crap" were added in the fifties or sixties when the building housed "Montaldo's," a very expensive women's clothing store. Interestingly enough, Montaldo's was a chain that would advertise in the New Yorker and similar upscale magazines. I used to be amused because the locations of their stores were something like: "Beverly Hills, Aspen, Durham." Now I won't swear to those exact cities, but the other cities were far from Durham. How they ended up with a store here, I have no idea. The downtown store eventually closed, and they moved to South Square before finally going out of business in the late eighties or early nineties. Great info, and I love the "Beverly Hills, Aspen, Durham." Hard to imagine. Well, as often happens, my memory was a little more colorful than the facts. I googled Montaldo's Store and retrieved a lot of references to it. They went bankrupt in late 1994-early 1995. They were located in a very disparate group of cities including Denver, Colorado Springs, St. Louis, Richmond and Durham (but not Beverly Hills or Aspen). They also had at various times stores in Charlotte, Winston-Salem, Raleigh, Greensboro and Chapel Hill. I suppose that strong North Çarolina presence accounts for the Durham store. Still, North Carolina, Missouri, and Colorado seems like an odd choice of locations, particularly since the chain was founded in Independence, Kansas. Anyway, Montaldo's is dead but their "panels of Pepto-Bismol-colored crap" live on. I could say that that seems to be Durham's usual fate. But I'd better not: Mike Woodard might take me to task for insulting the hard work of generations of Montaldo's employees. I'm sure denigrating the fine employees of Montaldo's would fill my comment section with the sanctimony of their board of directors. 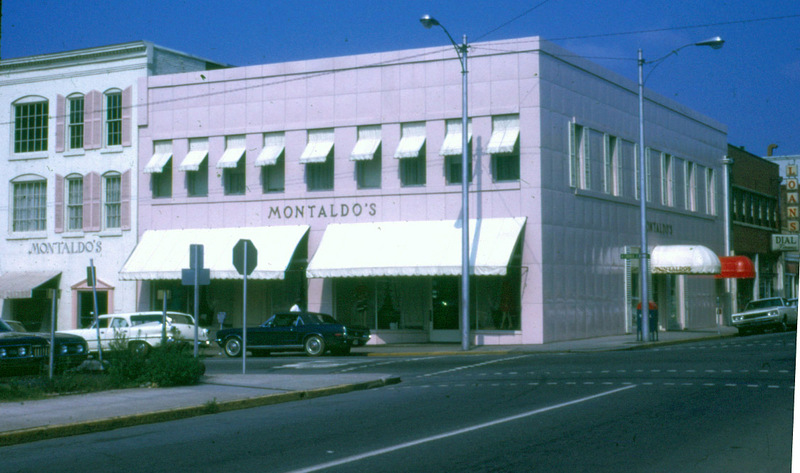 Montaldo's was an elegant specialty store in downtown San Francisco when I lived there in 1959. I well remember a soft, red wool coat I saved for from there and it was light weight and just right for California mild winters. The ladies who worked at Montaldo's treated me as if I were an important customer even though I was twenty years old and purchased only one coat. I like the pink tiles since they remind me of what was once there. 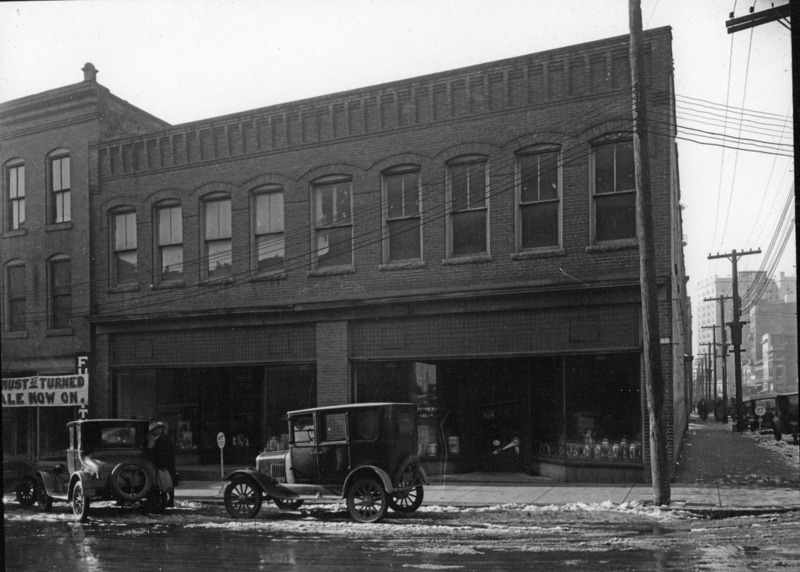 128 East Parrish St., the southwest corner of North Church St. and East Parrish St., housed a hardware store when this picture was taken in the late 1920s during a snow melt. The name on the glass says "Taylor and Ph(?)" (can't read the last name). It currently houses law offices. Since so many of the buildings on East Main, East Parrish, and North Church house businesses serving the courthouse (lawyers, bail bonds, etc.) it will be interesting to see what happens to this side of town once the courthouse moves down to S. Mangum St. Will the lawyers move down to Scientific Properties' or Struever's new developments down that-a-way? Will those properties take bail bondsmen as tenants - or will the bondsmen have stay behind while the lawyers migrate? We can certainly be assured that these few blocks will be in-flux; perhaps that will mean opportunity, or our current courthouse might prove rather difficult to unload or rent, meaning a vacant behemoth on the landscape.